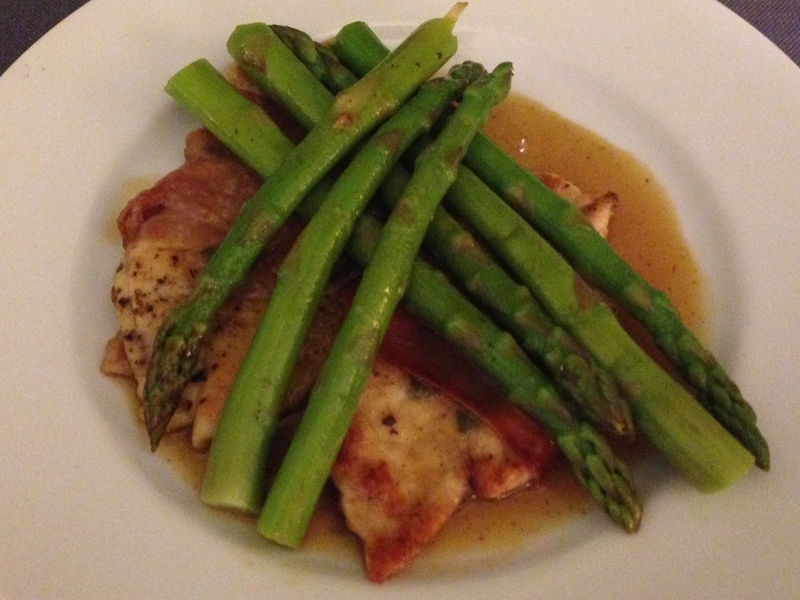 On Saturday night, we made Mario Batali’s Chicken Saltimbocca with Asparagus, which turned out to be a huge success. I honestly don’t think we’ve made anything else in our six years of cooking together that looked so pretty on the plate and (despite having more than a few steps) was so easy to make. What makes this dish special in that it uses a sweet, Italian dessert wine called vin santo (literally, “holy wine”) in the sauce. We had this wine during our recent trip to Tuscany and were excited to try cooking with it. One thing to note, however, is that vin santo can be a little on the expensive side, at least based on our experience. We think this recipe would probably work just as well with Marsala or Madeira, which should be much less expensive, or even with a white wine. To make this dish, I first cooked the asparagus in boiling water for about 3 minutes, then drained it, and then cooled it under cold, running water. The asparagus was a bit soggy after boiling, so when I make this again, I will probably only cook it for only two minutes. I patted the stalks dry with paper towels and then put the asparagus off to the side while I focused on the chicken. I heated a tablespoon of olive oil in the Dutch oven and browned two chicken breasts for about 1 1/2 minutes per side, putting them on a rack set over a baking sheet when they were done. (As you can already see, there are a lot of steps to this recipe, but I also hope you can see how easy each step is.) I then repeated this process for the remaining two breasts. The next step was to make the sauce. I added the vin santo and chicken stock to the Dutch oven and boiled it over medium-high heat until the liquid was reduced by half, which only took about 2 minutes, not the 4 minutes mentioned in the recipe. I whisked in the butter and then carefully placed all four pieces of chicken in the sauce. I put the asparagus on top and let everything heat for a couple of minutes. Though the recipe doesn’t say to do this, I spooned the sauce over the asparagus and chicken while they finished cooking. Finally, I put two pieces of chicken on each place, with half the asparagus arranged on top, and spooned the sauce over everything. This dish was intensely flavorful, but also very well-balanced, as the sweet vin santo in the sauce went quite nicely with the salty prosciutto, the savory sage, and the slightly bitter asparagus that also feature in this recipe. We paired this with a bottle of 2011 Poggio Della Costa Grechetto, a white wine made in the Lazio regain of Italy, for a truly wonderful dinner.